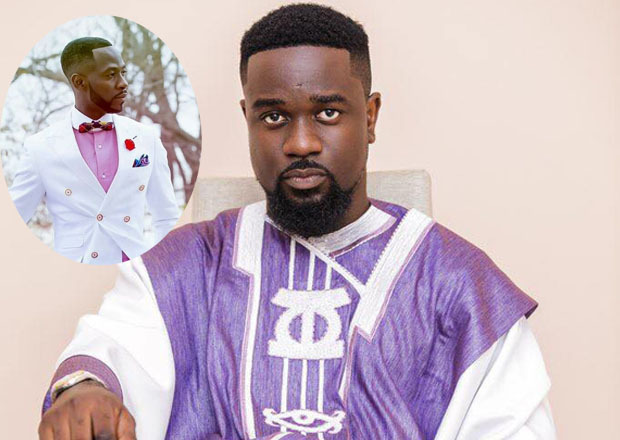 Ghanaian rapper, Micheal Owusu Addo popularly known as Sarkodie has taken to social media to acknowledge the ‘Rap doctor’, Okyeame Kwame’s approach to show business in the music industry. He described Okyeame Kwame as one of the few Ghanaian musicians who have productive and strategic management which has positioned his brands and products to greater heights. 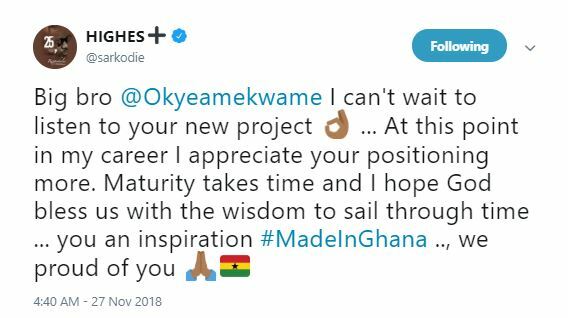 Sarkodie in a tweet revealed how expectant he is of Okyeame Kwame’s ‘Made in Ghana’ album and expressed how proud he is of him. “Big bro @OkyeameKwame I can’t wait to listen to your new project…At this point in my career, I appreciate your positioning more. Maturity takes time and I hope God bless us with the wisdom to sail through time….you are an inspiration#MadeInGhana…we proud of you,” Sarkodie tweeted. The ‘Rap doctor’ is preparing to release an album dubbed ‘MadeInGhana’, which is a 10 track album and also features music personalities and cultures across the 10 regions of Ghana. The album also features top musicians such as Kidi, Wiyaala, Wulomei, Kuami Eugene, Feli Nuna, Kurl Songx, Fancy Gadam, Afriyie Wutah, Kwan Pa and Atongo Simba. A lot of industry players and musicians have commended Okyeame Kwame’s ‘MadeInGhana’ album and described it as a good initiative.